MBT HABARI - Making its debut this Spring Summer 2019 is the HABARI. This new casual sandal is perfectly suited for office as well as your weekend outings. 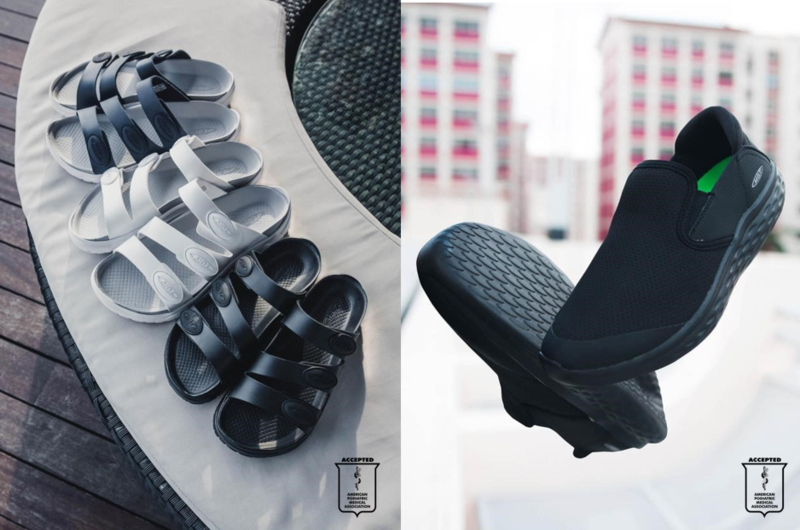 Soft Nubuck leather straps with microfiber lining and footbed pamper your feet comfortably as well as keeping odours at bay with its special SERDIA™ treatment. Patented MBT SensorTechnology™ and PivotAxis™ midsole work their magic to promote a soft landing and active roll forward in every step. 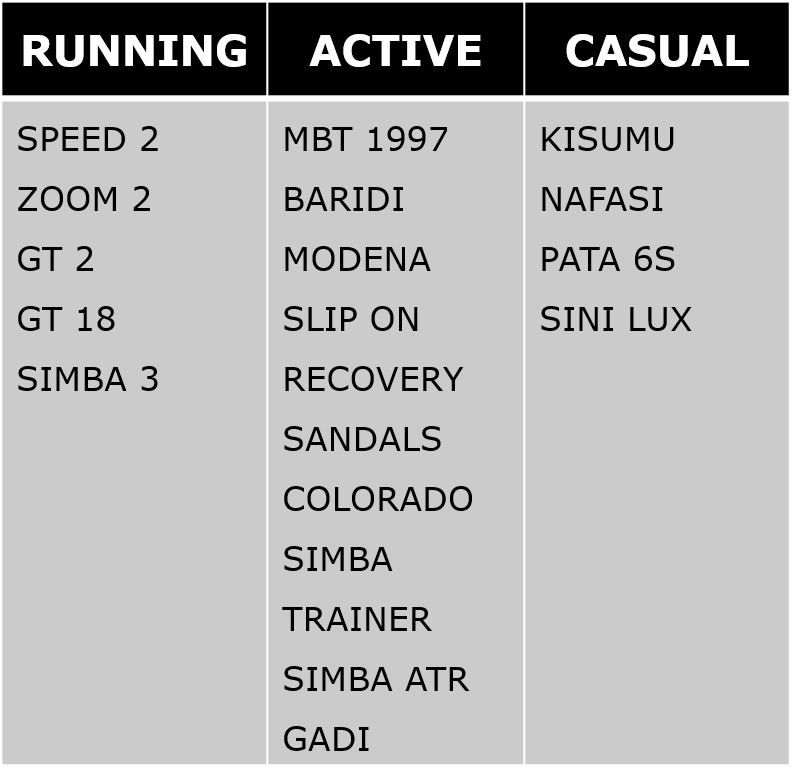 The HABARI is an MBT INDEX level – Performance, giving you medium rock. Classified as a Class 1 medical device in Europe, MBT’s unique rocker sole construction is proven to reduce lower back pain, improve your posture, balance and blood circulation. Available in Taupe, Indigo and Black, try the HABARI today, your feet will thank you for it! MBT RANI - The new RANI is perfect for the summer weather. Strappy Nappa leather upper keeps cool and stays chic. Microfiber lining and footbed pamper your feet as well as keeping it fresh with SERDIA™ treatment that absorbs odours. Patented MBT SensorTechnology™ and PivotAxis™ midsole work their magic to promote a soft landing and active roll forward in every step. The RANI is an MBT INDEX level – Performance, giving you medium rock and activation, improving your posture, balance, circulation and reduce lower back pain. Available in Taupe, Metallic Silver and Black. 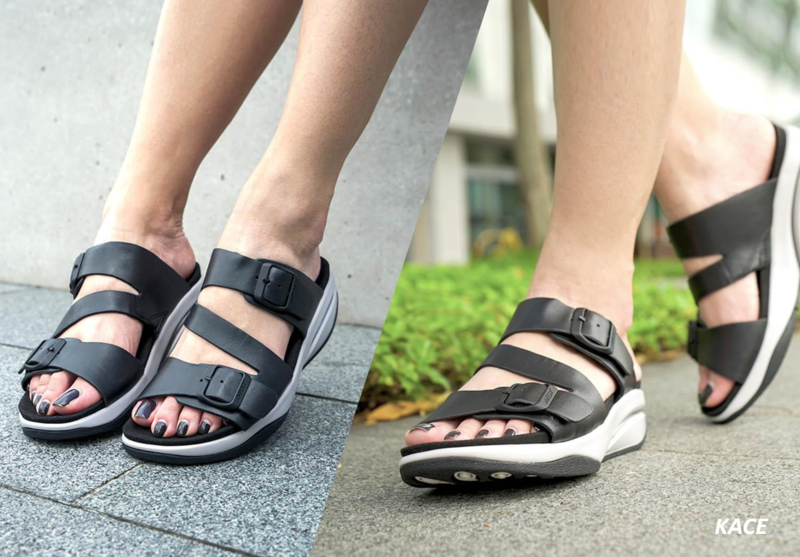 MBT® KACE - Shine in this stylish triple-strap number this summer! The new KACE sandals make its debut in trendy metallic hues. Nappa leather with soft microfiber lining and footbed ensures your feet stay pampered, oh did we mention its treated with SERDIA™? It absorbs odours so you can stay fresh all day. Patented MBT® SensorTechnology™ and PivotAxis™ midsole work their magic to promote a soft landing and active roll forward in every step. The KACE is an MBT INDEX level – Performance, giving you medium rock. MBT®’s unique rocker sole construction is proven to reduce lower back pain, improve your posture, balance and blood circulation. Let your feet sparkle this summer with the new MBT® KACE. Available in Gold, Silver and Metallic Black. 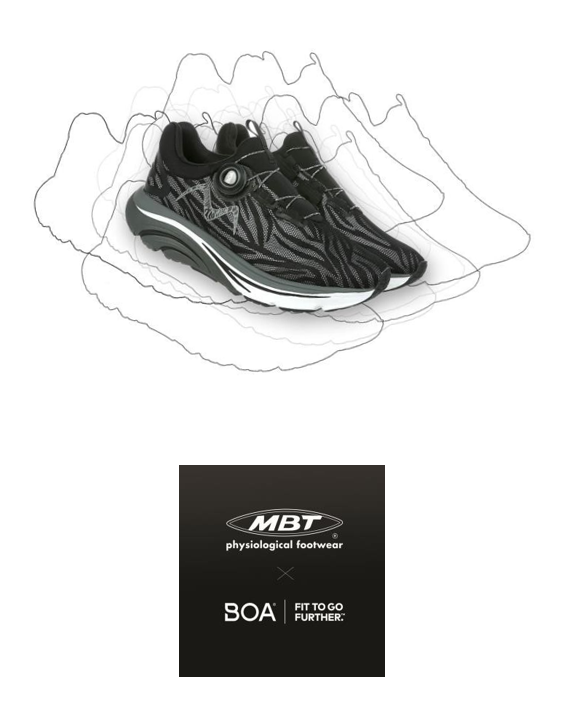 MBT® Running continues its propulsion into the running market this season with new colourways of its signature GT 2 and SPEED 2. 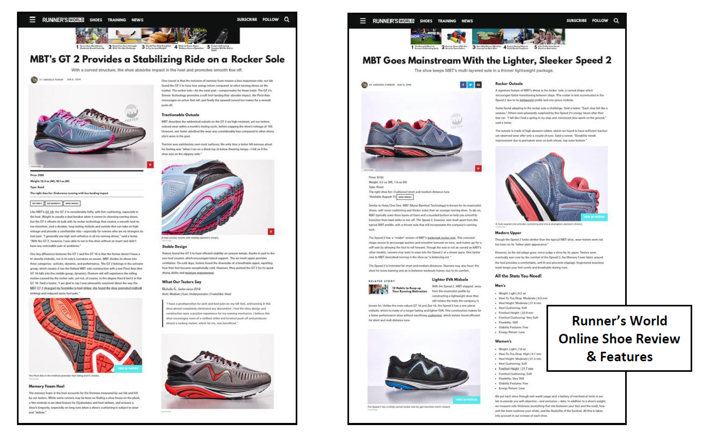 Rocker running with midfoot striking has gained popularity in recent years due to its efficient gait transition and smooth energy transfer from landing to toe-off. “The GT 2 is MBT®’s solution to the long run: It carries the company’s signature rocker shape into a plush, high-mileage trainer. The heel contains memory foam to soften impact forces, and wear-testers gave the shoe high marks for heel cushioning and overall comfort. The outsole features high-abrasion rubber and all this makes for a shoe that should satisfy mileage junkies and runners in pursuit of a cushy toe-off experience.” – Runner’s World USA. Our pinnacle running model GT 2 gets a cool makeover this season. 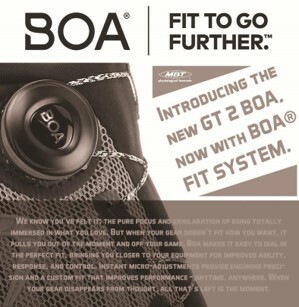 Partnering with BOA® Fit System, now you can dial in the perfect fit. 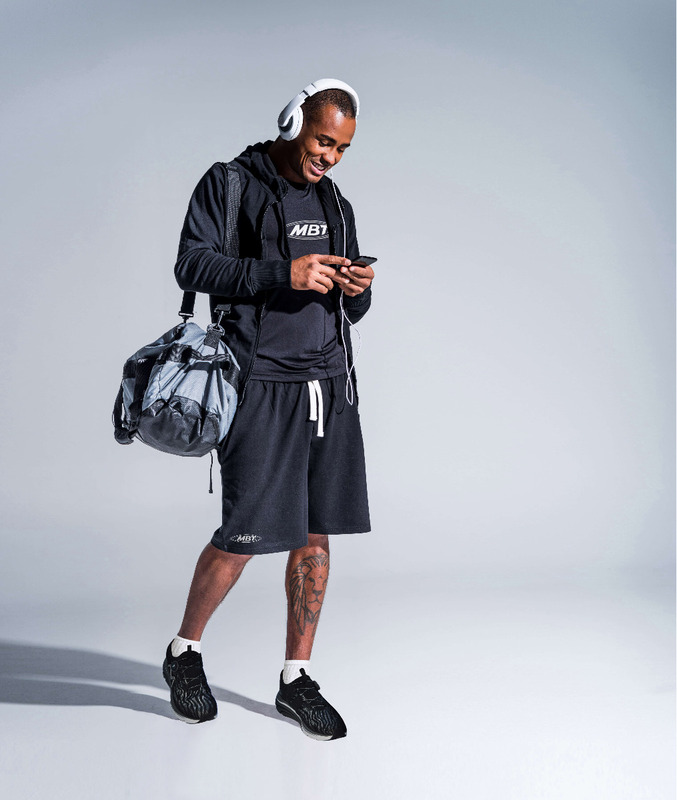 While the Boa Fit System is custom built for each unique product and use case, they all contain three integral parts: a micro-adjustable dial, superstrong lightweight laces, and low friction lace guides. Each configuration is engineered to optimize fit and provide precision, adaptability, and control. MBT® is very excited to launch its presence in Kuwait starting this Spring Summer 2019. Partnering with Alyasra Fashion, a regional fashion retail leader with a world class portfolio of over 60 high-end fashion, footwear and accessories brands. 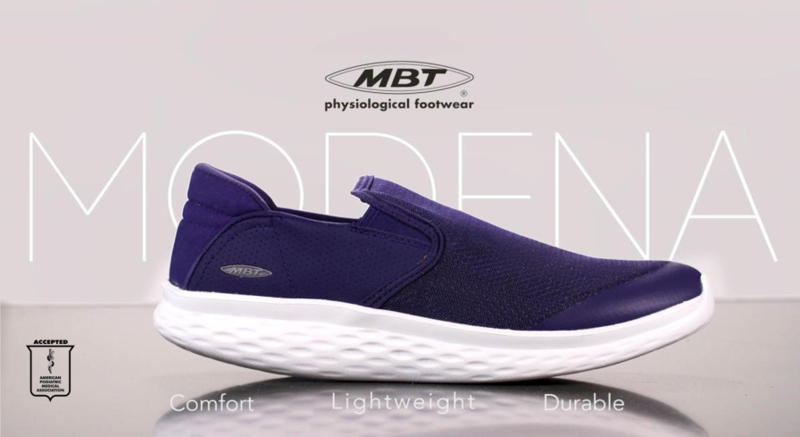 MBT®'s latest ultra-lightweight walking shoe – MODENA SLIP ON. New sole design made of lightweight, high-rebound foam for ultra comfort and energy return! And the secret to our extreme comfort? – an inbuilt shank at the midsole guides your foot and provides stability during your walking gait. Minimal seam soft mesh upper breathes and flexes with your every step. Lightweight, Cushy, Durable, nuff said.. Your feet don’t have to hurt, you just need the right footwear. Without proper support and cushioning, your feet tire out easily, and so do you. 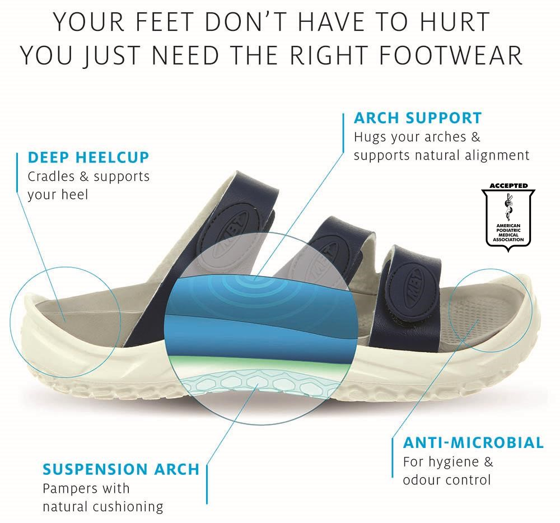 The anatomically shaped footbed in MBT® Recovery Sandal hugs and supports your arches and helps with your natural alignment. Made of special MBT® cushioning material for that ultimate cushioned ride. Go on, feel pampered with the new MBT® recovery sandals. by the American Podiatric Medical Association.